The Philippines' leading airline, Cebu Pacific, through its wholly-owned subsidiary Cebgo, increased flight frequencies to Siargao, the Surfing Capital of the Philippines, just in time for the summer break. Starting February 01, passengers will be able to choose from 12 weekly flights between Cebu and Siargao. From April 2017 onwards, guests can book up to twice daily Cebu-Siargao flights. Siargao lies in Surigao Del Norte in Mindanao, and is home to world-renowned surfing breaks. The most well-known of these is the Cloud 9, which is where the annual Siargao Cup is held every September. It was also recognized as CNN's ninth best surf spot in the world. "Siargao is a success story for the airline, and a true example of how inter-island accessibility can lead to development, tourism and business opportunities. CEB first launched flights to Siargao back in 2009. In a span of eight years, it has increased flight frequencies from only twice weekly to as much as fourteen times weekly today," said Alexander Lao, President and CEO for Cebgo. "With these additional frequencies, not only do we boost traffic to Siargao from Cebu, but we are also able to strengthen Cebu as a hub, while giving everyJuan more chances to explore one of the most beautiful islands in the Philippines," Lao added. 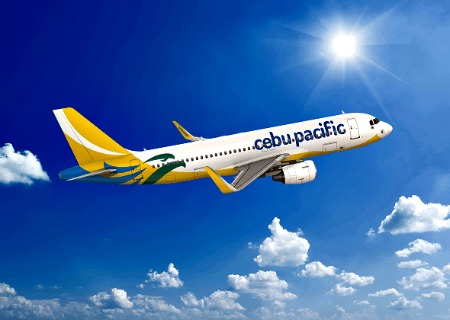 CEB's Cebu hub was recently strengthened with the launch of direct flights to Ormoc, Roxas and Calbayog. CEB continues to increase connectivity between Cebu and other destinations such as Tandag, Camiguin and Clark, among others. Overall, it operates direct flights to 25 domestic destinations and 5 international destinations from Cebu. For bookings and inquiries, guests can download the Cebu Pacific official mobile app, visit www.cebupacificair.com or call the reservation hotlines (+632)7020-888 or (+6332)230-8888. The latest seat sales can be found on CEB's official Twitter (@CebuPacificAir) and Facebook pages. CEB operates flights to 37 other domestic destinations and 29 international destinations, out of six strategically placed hubs in the Philippines: Manila, Cebu, Clark, Davao, Kalibo and Iloilo. The airline operates a fleet of 57 aircraft, comprised of four Airbus A319, 36 Airbus A320, seven Airbus A330, eight ATR 72-500 and two ATR-72-600 aircraft. Between 2017 and 2021, CEB expects delivery of one more brand-new Airbus A330, 32 Airbus A321neo, and 14 ATR 72-600 aircraft.